Brick Bar and its nextdoor sandwich shop T-Deli both recently shuttered in San Diego's Hillcrest, but the owners of FruitCraft: Fermentery + Distillery have already signed on to fill the vacancy and will soon be expanding into the neighboring space. Twin brothers Brian and Alan Haghighi founded The California Fruit Wine Co. in Carlsbad in 2009, initially running it as small business at area farmers' markets before opening the company's first production facility and tasting room in Vista in 2011. By 2014, due in significant part to a substantial commitment from Whole Foods Market, the urban winery took off. 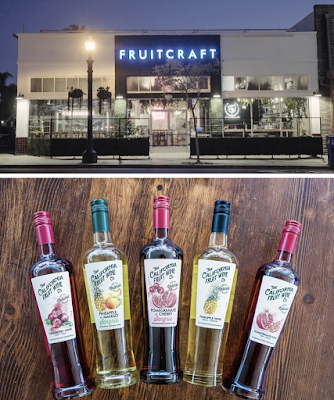 In fall 2016, the company negotiated a deal with their friends at Vinavanti Urban Winery's tasting room in Hillcrest for the opening of a The California Fruit Wine Co.'s tasting room that they since rebranded into FruitCraft Fermentery + Distillery, which reopened it in summer 2017. Over the past year, the company has expanded their production to include red wine, cider, mead, and kombucha (hard and regular). FruitCraft has begun construction on the neighboring spaces that last housed Brick Bar and T-Deli, businesses which the company purchased outright in order to expand. The Brick Bar space will be transformed into an event-venue area with a substantial outdoor back patio that will allow FruitCraft to host private parties and weddings. The T-Deli space will become a cafe - serving brunch, lunch, coffee drinks, teas and also house a kombucha bar. The company will continue to serve its lineup of fruit-based wine, as well as distilled fruit brandies in a variety of flavors, craft cocktails, cider, mead, kombucha, and a more expanded dining menu. For more information on FruitCraft Fermentery + Distillery, visit fruitcraft.com.